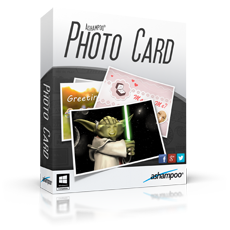 Description: Ashampoo Photo Card is the intuitive and straightforward solution to turn your photos into stunning greeting cards complete with borders and texts in a few clicks. Show someone you care and send your own custom-made greeting card. With Ashampoo Photo Card, turning photos into greeting cards becomes a simple point and click operation: select photo or take webcam snapshot, select theme, edit text, send card. No matter what the occasion, Ashampoo Photo Card comes with various themes to simply convey thanks or express any feeling in style. And the integrated clipart library helps you add additional subtlety. Adjust size, brightness, contrast and saturation settings or mirror and flip your photos, all right from within Ashampoo Photo Card. Ashampoo Photo Card gives you several options to share your cards with friends and family. Upload them to Ashampoo Web, share them on Facebook and Picasa or simply email them. Naturally, you can also save your work to disk and make adjustments at a later time.